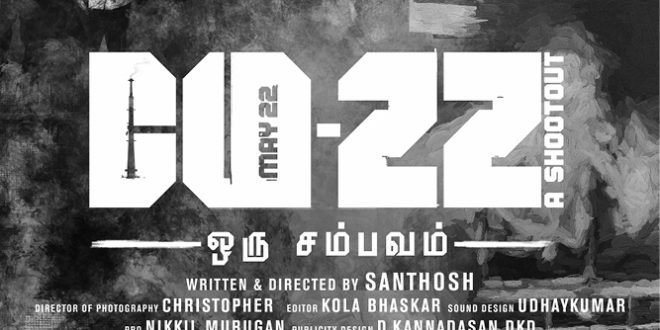 The team of Ahimsa productions is delighted to announce its project #2 titled MAY22 – oru sambavam. The poster launch and the title unveiled at the famous World economic forum in Davos -Switzerland World Economic Forum (WEF) is an independent non-profit organization dedicated to improving global economic and social conditions on a global scale. It is well known for its annual meeting held in January in Davos, Switzerland. As we are at the crux of several sociopolitical changes in Tamil Nadu, the launch at this forum is adept. The team is represented by the director Sathosh Gopal whose directorial debut JALLIKATTU 5-23rd Jan 2017 is to be released soon. This is a film inspired from the series of events that has stirred Tamil Nadu in recent times. It is a fiction inspired from true events. It is also a part of the trilogy of films by the director and the first of its kind in Tamil where the characters between films will flow and feature in each of it. In past the trilogies that been widely acclaimed were Apu Triology and the Three colours (Red, Blue, White) by Krzysztof Kieslowski. The film is bankrolled by Ahimsa productions headed by Nirupama. In a separate event the cast and crew of the film will be presented. Previous In a first, feature film to be exclusively produced & released on YouTube!